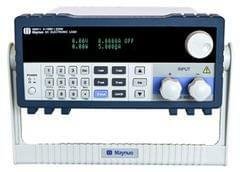 M97series DC electronic load, as a new generation product of Maynuo Electronical Co., Ltd, is designed with high-performance chips, high speed, high accuracy and with resolution of 0.1 Mv and 0.01 mA (the basic accuracy is 0.03%, the basic current rise speed is 2.5 A/us). M97 series has a wide application in production line (cell phone charger, cell phone battery, electric vehicle battery, Switching power supplier, linear power supplier), research institutes, automotive electronics, aeronautics and astronautics, ships, solar cells, fuel cell, etc. M97 series offers users with its novel design, rigorous process and attractive cost-effectiveness.